The Government of Zimbabwe, led by President Emmerson Mnangagwa is on record calling for the unconditional removal of the Western imposed illegal sanctions on the Southern African State, arguing that the punitive measures have set the country back decades in terms of development. Similarly, there have been recent media reports to the effect that a group of South Africa-based civic society groups was in the nation's second capital, Bulawayo, campaigning for the removal of same, arguing that the sanctions were now affecting the Southern African Development Community (SADC) bloc. However, the Movement of Demarcating Change (MDC) led by Nelson Chamisa, which called for the imposition of the sanctions on Zimbabwe and is no record supporting their stay, sees nothing wrong with the punitive measures because they double as their leverage to gain political power through the back door. As a mere opposition political party, the MDC does not have to grapple with turning around an economy under restrictions. It is not their problem not having anywhere to buy spare parts for airplanes already in service because the country is under sanctions. 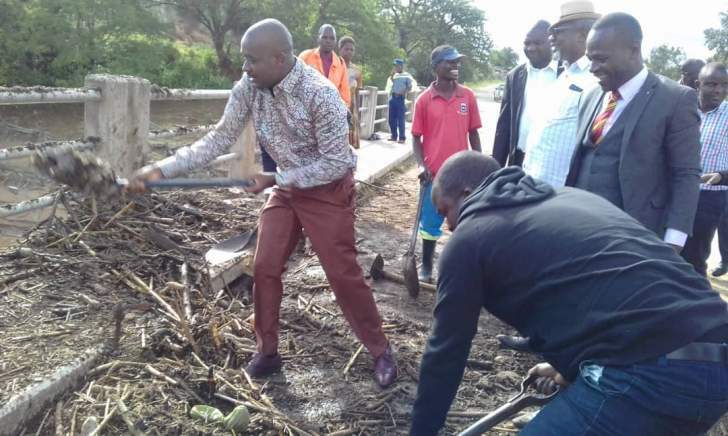 Chamisa's recent visit to parts of Manicaland Province affected by cyclone Idai, which was mainly a publicity stunt, saved an unintended purpose of bringing him face to face with how ruinous sanctions have been on Zimbabwe. Writing on his Twitter handle after the visit, the opposition leader claimed that the people of Chimanimani were "marginalized and tormented". While it is true that there is no province in Zimbabwe without people living in abject poverty, you cannot call the people of Manicaland marginalized. This also explains why there are no western sponsored pseudo rights groups claiming to be advocating for the wellbeing of the people of Manicaland Province. If anything Manicaland is one of the provinces that are not going to struggle establishing themselves as an economic powerhouse after the full implementation of the devolution policy. To start with, the country's first ever Central Business Register (CBR) Inquiry Revised Report of 2015, undertaken by Zimbabwe National Statistics Agency (Zimstat) between 2012 and 2015, revealed that the Province had the highest number of operating business establishments in the country, paged at 5 895 topping Harare and Midlands provinces who had the second and third highest numbers. The province is also endowed with minerals and a good climate for agriculture. So what is it that Chamisa misconstrued as marginalization? – Effects of sanctions. The people of Manicaland had the potential to excel economically had the country not been under sanctions. The harsh economic environment that ensued as a result of the sanctions meant timber saw mills and harvesters could not get spare parts from Europe, leading to the extreme scaling down of operations of companies such as Allied Timbers, Boarder Timbers and The Wattle Company. Even the once vibrant horticulture sector also took a nose dive. Chamisa also claimed that the disaster preparedness of the entire infrastructure of the State is a disaster. However, an official of the United Nations (UN) Office for the Coordination of Humanitarian Affairs, Gemma Connell, gave out that the impact of cyclone Idai was not anticipated. "There are some things you can't prepare for...even the best prepared effort can face challenges when the reality hits." However, even if Zimbabwe was to equip the Civil Protection Unit (CPU); it would be difficult to get the best equipment such as the MH-60T Jayhawk helicopter manufactured in the United States of America simply because the country is under sanctions. To add to that the Zimbabwe National Army ZNA's response was delayed firstly by the force of the cyclone which made flying helicopters impossible and also by the trail of destruction left. As confessed by Chamisa himself, areas most affected by the cyclone such as Nedziwa, Ngangu, Kopa, and Skyline were unreachable as the roads were impassable. The long and short of it is that, had Zimbabwe not been under US sanctions its response to cyclone Idai could have been much better. It also goes to show that by imposing sanctions the US was deliberately out to harm the people of Zimbabwe as it is impossible to defend oneself with hands tied on your back.